A Pattaya Radio station said that the issue of the British Embassy stopping providing certification of income letters to its nationals means an end to the easy ride of foreigners living in Thailand. The report on Fabulous103FM said they had contacted the embassy who said there were not now in a position to ensure financial statements were correct. They and perhaps other embassies could not be held liable for financial details. Fabulous103FM - that operates out of Pattaya - stated that those caught offering "under the table" payments would be "caught out". The changes come in the wake of Maj-Gen Surachate Hakparn taking over as the new chief of immigration last week. "Big Joke", as he is affectionately known in the media, has promised to get tough on criminals. Fabulous103FM said that while foreigners were still welcome it was clear that "the gloves were off" now and the "heat is on" for expats in Thailand without a visa*. They also said that companies offering "visa services" were coming under scrutiny. It is not yet completely clear as to whether the change is as a result of British Embassy policy or they have reacted as a result of pressure from the Thai authorities. Requests to several people at the British Embassy for comment and clarification have been made but no replies have been received except a standard automated reply that one of their officers was out until Wednesday. However, the Canadian Embassy in Bangkok on Tuesday told Thaivisa: "there is no plan to change anything related to income letters for the immediate future". Responses to a Thaivisa story on the issue revealed that an increasing number of expatriates and people living in Thailand were seriously concerned about their future. Some stated on a thread that they were considering leaving Thailand. Many others commenting believed the move was likely to have been ordered by the Thai authorities in a bid to close a loophole that allowed those who have insufficient funds or income to remain in Thailand long term. Other expats questioned how the new requirement would be interpreted and implemented by immigration offices in Thailand, which are known for their inconsistency when it comes to enforcing rules. 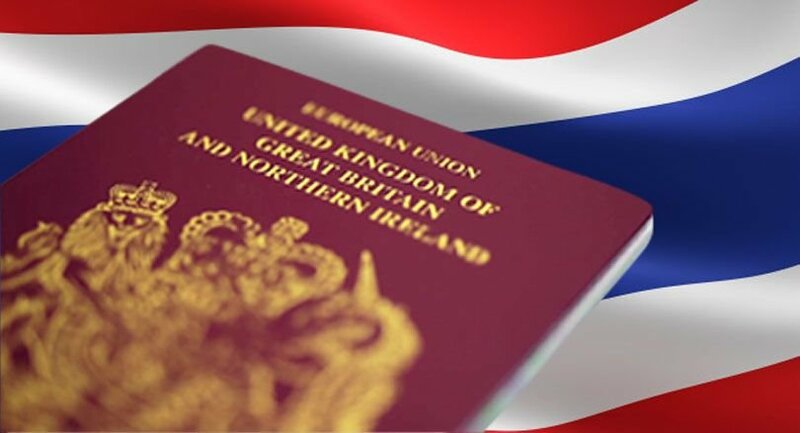 One expat in Hua Hin told Thaivisa: "it will simply be easier and cheaper to just go back to the UK soon". * - Edited to add: the "heat is on" for expats in Thailand without a visa. Let's break down what's happening objectively. The British embassy will stop issuing income letters. They are telling their nationals wanting to use an income method to show bank deposits in Thailand instead. Thai immigration officially still REQUIRES embassy income letters of all nationals. Confused? You should be. For now, it would be rational for Brits to prepare to use the 800K bank in a Thai bank method and ignore the strange advice from their own embassy. For now, this appears to only be a British thing in stopping the income letters. There is no hard evidence that it will spread, only fear and rumors. As far as CORRUPTION. As far as VISA AGENTS and IMMIGRATION OFFICERS engaging in corruption allowing applications that don't even begin to comply with the rules get accepted in exchange for cash payments, the possibility that there might someday be a CRACKDOWN has always been there. Is that crackdown going to happen soon? Maybe. Maybe not. Personally I have always warned people not to use visa agents in that way because you never know, someday it might bite you real bad. As far as people doing LEGIT applications, bank or income (if not British) there is as yet no confirmed news that there is any change at all. Maybe there will be such changes soon, and I understand the reason that people of all nationalities are freaking out and that's including people not engaged in corruption, but I think it's time to CHILL until we actually hear confirmed news of such major changes (for all nationals). Brits who are going to have problems complying even legitimately, OK, it might be time for them to panic. Once again it's the scammers who have made it difficult for those people who have played by the rules, that was true when it came to misuse of tourist visa's to live here, education visa's, marriage visa's and now scrutiny of income. Utter pile of rot. Yesterday I bumped into a visa agency guy I have known for years. He told me last week things looked tough. Yesterday, everything was back to normal. Has anyone here ever known a crackdown on anything to last more than a week? I am sure there will be fun and games, and probably payments to deal with the proof of finances issue, but nothing of substance is likely to change. So you're essentially saying this entire thing was one big wind up? Yes, you're right, "crackdowns" tend to be some PR noise for a little while, and then fade, but that doesn't mean it isn't possible for a crackdown someday to actually be real and persistent. Yes, even if this is a PR stunt some will get caught up in the mess at some point. If you have the money, you will not have a problem. If you don't, what are you doing here? Forgive me, but what is the big deal? They aren't going to toss people in the ocean, are they? It seems like a simple administrative matter and a solution will come. Wind up might be the wrong terminology. It made big waves out there, which is no bad thing if you are looking for some votes a little way down the track. I dont know if the Embassy letter issue is of coincidental timing, but what was not possible regarding visas on Friday last week, apparently was possible again yesterday, so you can draw your own conclusions. If you have the money, you will not have a problem. If Thai Immigration required the letter before, then some alternative will be found. Thai immigration has ALWAYS required embassy income letters for income based applications. Thai immigration has made no announcement that they will change that as yet. Let's deal with FACTS, rather than assumptions and wishes, shall we? Well you're making a reasonable prediction based on past history. But past history doesn't always predict future events. If it walks like a duck and quacks like a duck...? The stories and posts on this issue are multiplying like weeds, and getting to be a bit of a circle jerk -- now we've got ThaiVisa reporting on 103FM reporting on ThaiVisa..... Yeesh!!! If accurate, PERHAPS, that is a good sign that the British Embassy decision re income letters won't be the first in a wave of similar actions by other country embassies here. "..Let's deal with FACTS, rather than assumptions and wishes, shall we?" You are assuming that thousands of people are going to have trouble; that is not realistic.